ESPOO, Finland (AP) — Some of the top women’s hockey players in the world are vowing to use their voices to shape the future of the sport in North America after the six-team Canadian Women’s Hockey League announced it is shutting down after 12 seasons at the end of this month. The CWHL announcement Sunday was followed just two days later by word that the National Women’s Hockey League planned to establish teams in Canada’s two largest cities , Toronto and Montreal, by next season. The NWHL currently has five teams, all in the U.S. The rapid-fire developments came as players from both leagues gathered in Finland for the world championships, which start Thursday. Eighteen of 23 players on Canada’s roster, six from the U.S., and two each from Finland and Japan played in the CWHL this past season. Canadian captain Marie-Philip Poulin, a three-time CWHL MVP with Les Canadiennes de Montreal, said the game’s biggest names must form a united front when tournament ends in mid-April. Calls for one women’s professional league in North America have increased over the last year. One league’s dissolution opens that door, but is women’s hockey ready walk through it? Canadian forward Brianne Jenner hoisted the Clarkson Cup trophy a week before the CWHL declared its demise . 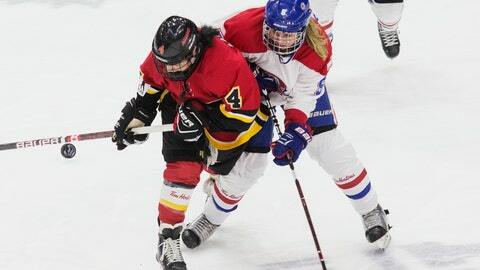 Her Calgary Inferno beat Les Canadiennes 5-2 in Toronto. Prior to the 2017 world championship on home ice in Michigan, the U.S. players threatened to boycott the tournament if USA Hockey didn’t provide more financial and competitive support for the national women’s team. They won several concessions from their federation. The prospect of losing what the Les Canadiennes have built in Montreal worries Caroline Ouellette. The four-time Olympic gold medalist played for Les Canadiennes before retiring last year and stepping behind the bench. She is one of Canada’s assistant coaches in Espoo. She echoed the need for top players to get involved as soon as possible to get the league they want.